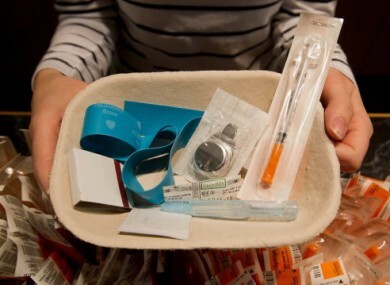 A nurse holds a tray of supplies for use by a drug addict at the Insite facility in Vancouver. CANADA’S SUPREME COURT ruled today that the only legal drug injection facility in North America can stay open, despite objections from the government. The Vancouver-based facility Insite was was founded eight years ago as a safe and humane space for drug abusers and receives taxpayer funding. Clients bring their own (illegal) drugs to Insite, but the facility provides clean needles and nurse supervision. However, the government accused it of assisting drug abuse and sought to shut it down. The Toronto Sun reports that in its ruling, the Supreme Court said that if the facility’s closure would prevent injection drug users from accessing the health services it offered, “threatening the health and indeed the lives of potential clients”. The health minister was ordered to issue an exemption for the site from drug possession and trafficking laws, Macleans reports. Responding to the court ruling today, Vancouver Coastal Health Authority CEO Dr Patricia Daily said that treatment is the end goal of the facility, the Winnipeg Free Press reports. Other medical groups say that the facility has saved lives and the ruling now means that similar clinics can open elsewhere in Canada. However, the Drug Prevention Network of Canada, which does not support Insite, described the court ruling as “arrogant”. The government said that although disappointed by today’s decision, it will abide by the ruling. Email “North America's only legal drug injection facility to stay open, says Canadian court”. Feedback on “North America's only legal drug injection facility to stay open, says Canadian court”.